↑ Kennedy, John F."Special Message to the Congress on Urgent National Needs". jfklibrary.org, May 25, 1961. ↑ Murray and Cox, Apollo, pp. 16-17. Chaikin, Andrew. 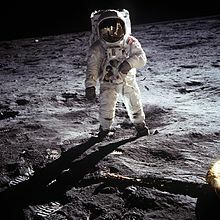 A Man on the Moon. আইএসবিএন ০-১৪-০২৭২০১-১. Chaikin interviewed all the surviving astronauts and others who worked with the program. Cooper, Henry S. F. Jr. Thirteen: The Flight That Failed. আইএসবিএন ০-৮০১৮-৫০৯৭-৫. Although this book focuses on Apollo 13, it provides a wealth of background information on Apollo technology and procedures. French, Francis and Burgess, Colin, In the Shadow of the Moon: A Challenging Journey to Tranquility, 1965-1969. আইএসবিএন ৯৭৮-০-৮০৩২-১১২৮-৫. History of the Apollo program from Apollo 1-11, including many interviews with the Apollo astronauts. Kranz, Gene, Failure is Not an Option. Factual, from the standpoint of a flight controller during the Mercury, Gemini, and Apollo space programs. আইএসবিএন ০-৭৪৩২-০০৭৯-৯. Lovell, Jim; Kluger, Jeffrey. Lost Moon: The perilous voyage of Apollo 13 aka Apollo 13: Lost Moon. আইএসবিএন ০-৬১৮-০৫৬৬৫-৩. Details the flight of Apollo 13. Pellegrino, Charles R.; Stoff, Joshua. Chariots for Apollo: The Untold Story Behind the Race to the Moon. আইএসবিএন ০-৩৮০-৮০২৬১-৯. Tells Grumman's story of building the Lunar Modules. Robert C. Seamans, Jr. Project Apollo: The Tough Decisions. আইএসবিএন ০-১৬-০৭৪৯৫৪-৯. History of the manned space program from September 1, 1960 to January 5, 1968. Slayton, Donald K.; Cassutt, Michael. Deke! An Autobiography. আইএসবিএন ০-৩১২-৮৫৯১৮-X. Account of Deke Slayton's life as an astronaut and of his work as chief of the astronaut office, including selection of Apollo crews. Wilhelms, Don E. To a Rocky Moon. আইএসবিএন ০-৮১৬৫-১০৬৫-২. The history of lunar exploration from a geologist's point of view. Apollo Archive - large repository of information about the Apollo program. Apollo Flight Film Archive - repository of scanned Apollo flight film (in high resolution).